Welcome to Cambridge Bingo & Gaming! Never miss your chance to win an exciting prize! It’s easy and it only takes a few minutes to get one of our Loyalty Cards. See the session manager for complete details, become a cardholder today. Remember no dues, no fees… it’s all FREE! The Cambridge Gaming Centre’s Loyalty Card program is unique and exciting, created and designed to reward you, our valued patrons. 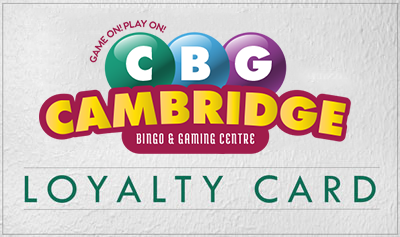 Each time you visit the Cambridge Gaming Centre and swipe your card, you earn points on your Loyalty Card. These points can then be redeemed for ballots on weekly draws that are not available to the general public. Participation is completely optional and is free to all patrons. On your next visit, ask a manager for an application for our loyalty card program, or download the form right now so that you can fill it out and bring it to us in person. Sign up for Jackpot Alerts! Just fill out the form below, and you will receive emails with all our jackpot information, as they happen!